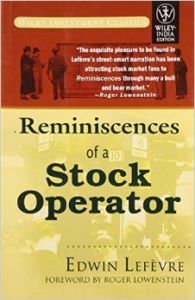 Reminiscences of a Stock Operator is adapted from a series of Saturday Evening Post articles written by Edwin Lefevre in the 1920s. The book narrates Livermore's ascent from a "Boy Plunger" to the most influential speculator on Wall Street. While much of the book is devoted to Livermore's experiences, a larger part of the book deals with trading wisdom and rules that Livermore imparts through Lefevre. Years later, many trading and investing books repeat the very same rules first enunciated by Livermore in Reminiscences, such as: go with the trend, no stock is too high to buy or too low to sell, let your winners run and cut your losses short, make your own decisions and market history repeats itself. Interestingly, Livermore frequently violated his own rules and usually lost money as a result. The enduring appeal to the book rests in Livermore's view that the market is made up of people and the excesses of the market reflect mass psychology and the mistakes of individuals are frequently the result of the inability to control fear and greed. Thus, the views and lessons of Livermore continue to be relevant to every new generation of investors and traders.